Africa’s food requirements, along with its population, are growing fast. Three research programmes ask how a better understanding of viruses, parasites and the spread of disease can pave the way to improving agricultural yields. By contrast, a parasite that emaciates cattle across sub-Saharan Africa has been around for thousands of years but continues to take its toll on certain species of the animals it infects. Prominent ribs are the frequent hallmarks of trypanosomiasis – caused by the presence of a cunning parasite that evades the animal’s immune system by periodically changing its protein ‘coat’. Meanwhile, farmers in Ethiopia are turning away from the traditional zebu cattle towards breeds that produce greater quantities of milk. 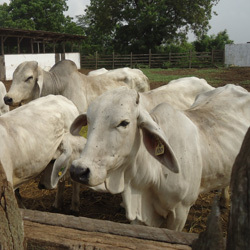 As a result they are exposing their herds – and themselves – to increasing levels of tuberculosis (TB) that are brought about by intensified animal husbandry practices. What links cabbages and cows are three programmes that hope to connect fundamental research with improving farm yields, and in so doing contribute to solving a looming pan-African problem. More than half of global population growth between now and 2050 is expected to occur in Africa. And more people means a requirement for more food. The difference that increasing productivity can have on farmers’ livelihoods is not lost on an insect expert at the University of Ghana, Dr Ken Fening, who is working on another food-related research project. Cabbages are not indigenous to the continent but have become a major cash crop for Ghanaian farmers and an important source of income for traders to markets and hotels. “A good crop can bring in money to buy fertilisers and farm equipment, and also help to pay for healthcare and education for the family,” he says. Recently, however, fields of stunted, yellowing, wilting cabbages, their leaves curled and dotted with mould, have become an all too familiar and devastating sight for the farmers of Ghana. Farmers were typically seeing the total loss of their crops and he realised that the devastation couldn’t just be caused by sap-sucking insects. Despite no previous reports of viral diseases affecting cabbage crops in Ghana, the symptoms suggested a viral pathogen. With funding through the CAPREx programme, Fening began work with Cambridge plant biologist Dr John Carr. 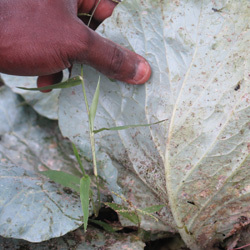 The pair collected samples of cabbage plants in Ghana showing signs of disease, and also aphids on the diseased plants. Back in Cambridge, Fening used screening techniques including a type of DNA ‘fingerprinting’ to identify the aphid species, and sophisticated molecular biology methods to try to identify the offending virus. “We found that two different species of aphids, pink and green, were generally found on the diseased cabbages,” says Fening. “It turned out this was the first record of the green aphid species, Lipaphis erysimi (Kaltenbach), ever being seen in Ghana.” The pink aphid was identified as Myzus persicae (Sulzer). What’s more, the virus was not what Carr expected, and work is now ongoing to identify the culprit. The sooner it can be characterised, the sooner sustainable crop protection strategies can be developed to prevent further spread of the disease not only in Ghana, but also in other countries in the region. Another researcher who hopes that eradication strategies will be the outcome of her research project is Dr Theresa Manful. Like Fening, she is a researcher at the University of Ghana and a CAPREx fellow. She has been working with Cambridge biochemist Professor Mark Carrington on African animal trypanosomiasis. Carrington has worked for a quarter of a century on the parasite that causes the disease. He understands how the organism evades the immune system of the animal by changing its coat proteins so as to remain ‘invisible’. Manful and Carrington set about testing herds in Ghana. They discovered that several trypanosome species can be found in the cattle at one time and that nearly all cattle were infected most of the time. For Manful, one of the important gains has been the ability to expand the research in Ghana: “I now have a fully functional lab and can do DNA extraction and analysis in Ghana – I don’t have to bring samples to Cambridge. We are teaching students from five Ghanaian institutions the diagnostic methods.” She and Carrington have been recently funded through a Royal Society Leverhulme Trust Africa Award to continue their work. “Agriculture faces increasing challenges,” adds Carr. “Bioscience is playing a crucial part in developing ways to mitigate pest impact and reduce the spread of parasites. ETHICOBOTS is funded under the Zoonoses and Emerging Livestock Systems (ZELS) programme, a research initiative in the UK jointly funded by six research council and government bodies. Dr Ken Fening and Dr Theresa Manful were funded by the Cambridge-Africa Partnership for Research Excellence (CAPREx) and The ALBORADA Trust, through the Cambridge-Africa Programme. Images: top: cabbage aphids (credit: Dr Ken Fening); bottom: cattle in Ghana (credit: Dr Theresa Manful and Professor Mark Carrington).